This tangy raita preparation makes for a wonderful summertime treat. 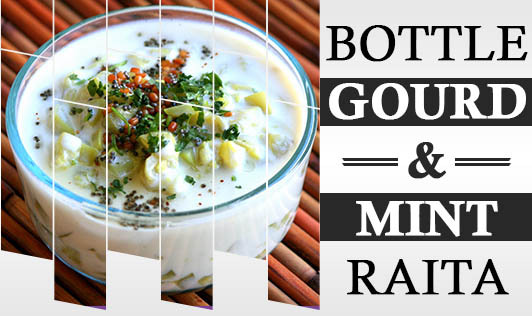 The bottle gourd blends perfectly with the minty flavor of the raita. The raita gives you minimum calories and makes for a perfect meal time feast for people trying to lose weight. Take the curd in a bowl and beat it with a whisker until it turns smooth. Set aside. Steam the shredded bottle gourd for 4 to 5 minutes, and allow it to cool completely. Put all the ingredients together in a serving bowl and whisk it all together. Note: Do not boil the bottle gourd as that will make it very mushy and will take the crunch out of the salad.